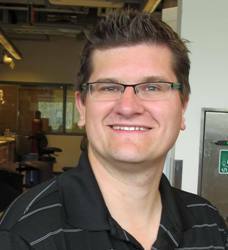 UWinChemBiochem News: Seminar: Andre Simpson (Department of Chemistry, University of Toronto, Canada) - Friday, Jan. 12, 2018 @ 3:00 p.m.
Seminar: Andre Simpson (Department of Chemistry, University of Toronto, Canada) - Friday, Jan. 12, 2018 @ 3:00 p.m.
Friday, Jan. 12, 2018 @ 3:00 p.m.
NMR spectroscopy is arguably the most powerful tool for elucidating structures and probing molecular interactions. Practically all environmental research, at least to some extent, involves working with ultra-complex natural mixtures that are ubiquitous in soil, water, and air. NMR can provide information not only as to the basic chemical structures present in a mixture, but can potentially provide information as to the self-associations of molecules (aggregation and flocculation processes), their mechanistic interactions with xenobiotics (transport of contaminants) and provide the direct connection between molecular scale processes (environments of individual nuclei) and macroscopic scale (visual), in the form NMR imaging. This presentation will take the audience through an evolution of my career from molecular-structure at one extreme to the impact of chemicals in living systems at the other. Structure: Understanding the structure of soils, air particles, and dissolved organic is a critical precursor to understanding how these materials function. This information is desperately needed to develop the most efficient soil remediation and agricultural practices as-well as better predict carbon sequestration and climate change. Interactions: With a better understanding as to the structural components and NMR assignments for key environmental matrices it is then possible to determine, how, where, and why contaminants get sequestered and are challenging to remediate. A range of novel NMR experiments will be introduced along with a new technology termed comprehensive multi-phase NMR. Comprehensive Multiphase (CMP) NMR, was co-developed between my group and Bruker Biospin. The approach combines all the electronics from solution-state, semi-solid and solid-state NMR into a single NMR probe. The resulting technology permits an uncompromised analysis of liquid, semi-solid and solid components within unaltered samples in their natural swollen state. As well as unravelling the binding orientation, and receptors for contaminants/drugs CMP-NMR is also capable of monitoring the kinetic transfer between and across interfaces providing an unprecedented window into otherwise inaccessible molecular information. Impact: With an understanding as to “what soil is?” and “which chemical components bind contaminants?" the key questions become “what does it all mean?” and “how are living systems impacted?”. For example, if a herbicide is bound tightly to the protein fraction of soil is it still bioavailable? Would this still hold true with climate change or change in land use? An even more challenging but important question is “out of the 100’s or 1000’s chemicals we are exposed to everyday which ones truly impacts our health?” Indeed similar questions are asked everyday by policy makers. NMR has great potential to address such challenges when employed as the “molecular interpreter” of living systems under environmental stress. In this final section in-vivo NMR is introduced on small invertebrates. Static studies (i.e. using a flow system and solution-state probes) provide a low stress environment to study metabolic flux in response to stressors. Conversely, CMP-NMR, can potentially be used to study and differentiate different phases (liquids (metabolites), gels (proteins, membranes), solids (shell, bone)) in-vivo. A wide range of novel experiments will be introduced that greatly improve the depth and breadth of information that can be obtained from NMR of living systems. Combined the approaches hold the potential to identify which are the most potent environmental stressors in complex natural samples, explain their toxic-mode-of-action and even act as early warning system to identify environmental stress, prior to disease, or ecosystem shifts.